Perfectly engineered for shorter rides, the Raleigh Bikes Venture Thru Comfort Bike is one of the hybrid bikes perfect for recreational activities. Whether you want to cruise through your neighborhood, on the campground or even the beachfront, the bike will deliver beyond your expectations. Even more appealing is that Raleigh Venture Thru Comfort Bike is available in lady’s version. In other words, there are girl specific features to optimize the riding experience of ladies. And you do not have to worry because you will be able to ride the bike regardless of your experience. Women riders have special needs. Raleigh is aware of this fact and it is evident in the design of Venture 3.0. First, the bike is lightweight measuring just 32.7 pounds. Such weight will not wear you down if you have to lift the comfortable bike for whatever reason. The bike features what Raleigh refers to as a True Comfort’ geometry. This design provides the rider with natural feeling on the upright riding position. It means you can ride the good bike for extended periods without feeling any discomfort or strain on your lower back or any part of your body. Venture 3.0 is sized and shaped for specific geometry for women. This greatly lowers the standover height and diminishes the distance between the handlebars and the seat (women love the shorter reach). Such design is excellent because many women confess their discomfort with unisex saddles or saddles made for their male counterparts. Forget about the brands of bikes that need frequent fixing or repairs. You will use the Raleigh Venture 3.0 for years before it requires any major attention. This level of durability is the function of the bike’s durable construction. 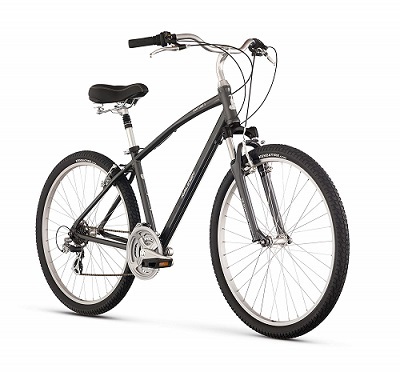 The bike features a strong, durable and lightweight aluminum frame. High-quality bikes normally feature aluminum frames because the metal is lightweight and corrosion resistant. Other components of the bike are also made of strong materials to boost longevity. Shimano is a Japanese Firm that is well known for providing great quality bicycle components. The Raleigh Venture 3.0 uses high-quality Shimano components to provide reliable and smooth great shifting. Besides great performance, the components are also durable. The Venture Thru Comfort features Revo twist shifter with front and rear derailleurs from Shimano. This makes sure that you are always on the right gear. The shifter offers you 21 speeds to select from. Simply pick a safe riding speed based on the terrain, your preferences, and the terrain. The shifter is easy to reach and it augments smooth peddling. Thus you will not need to exert too much force in riding. It means you do not have to be physically strong to enjoy a cruise along the beach or a sunny path in the neighborhood. Suspension fork plays an essential role in suspending the bicycle and the rider to insulate them from the roughness of the underlying terrain. Poor quality suspension fork allows the roughness of the terrain to reach you and thus interfere with your riding experience. Raleigh Venture 3.0 features high-quality SR Suntour fork that delivers 100mm of travel while at the same time dealing with the bumps of the road. The fork allows preload adjustment which assists in fine-tuning the riding performance of the bike. Bicycle wheels do the important job of converting the human power into the forward zoom. In other words, the size of the wheel is directly proportional to the speed of the ride of the bike. Larger wheels deliver better speeds because they offer lesser rolling resistance and smoother rides. Venture 3.0 comes with 27.5-inch wheels which are among the largest in the industry. For this reason, beginners will find the bike easy to ride. Such wheels also promote speed control while boosting speed and comfort. The wheels are fitted with Kenda tires which are among the best in the industry. Such tires are extremely versatile. They provide a smooth and stable ride on different kinds of terrains including rough and bumpy surfaces. This awesome recreational bike is fitted with an alloy micro-adjustment seat that offers optimal shock absorption. Atop the seat is the Royal Rumba comfort saddle. The saddle is specifically made for women. It ensures the ride is as smooth as it can get. Comfort handlebars fitted with comfort grip completes the great riding experience. The grip features soft but comfortable material with an ergonomic design. These comfort features added to the high-quality suspension fork provides an unmatchable ride. This Raleigh Venture 3.0 review cannot end without mentioning the high-quality brake system of the bike. It is fitted with dependable Pro Max front and rear alloy V brakes. Also called direct pull brakes or linear pull brakes, these V-brakes bring the bike into a stop when it matters most. The brakes are strong, durable and relatively resistant to environmental influences. Although you might have to replace them later, the V-brakes are very competent when they are optimal. 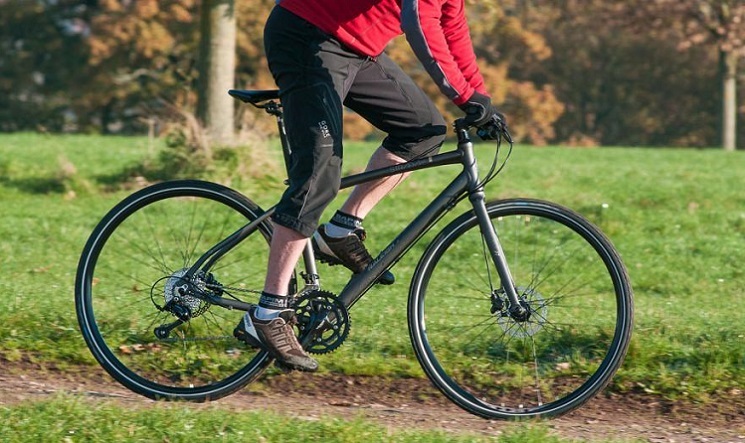 As you have learned from this Raleigh Venture 3.0 review, the bike has all it takes to be among the best. Women love it because of the comfortable ride, lightweight, versatile speeds and ease of set up. Its True Comfort geometry helps you maintain a more upright position resulting in lesser strain on your lower back and neck. Go for this affordable bike if you are a new and young female rider. Many of features are designed to improve comfort and safety of the rider. Since it is designed for short distance rides, the bike may not be suitable for use in advanced terrains.